American Solar Direct Archives - Solar Love! Home Tags Posts tagged with "American Solar Direct"
As we wrote months ago when it launched, Google has a free online service that uses its mapping information and partner offers from solar installers to try to hook you up with the cheapest solar panels on the market — by providing fast estimates of how much a homeowner might save by investing in a solar power system from various solar companies. 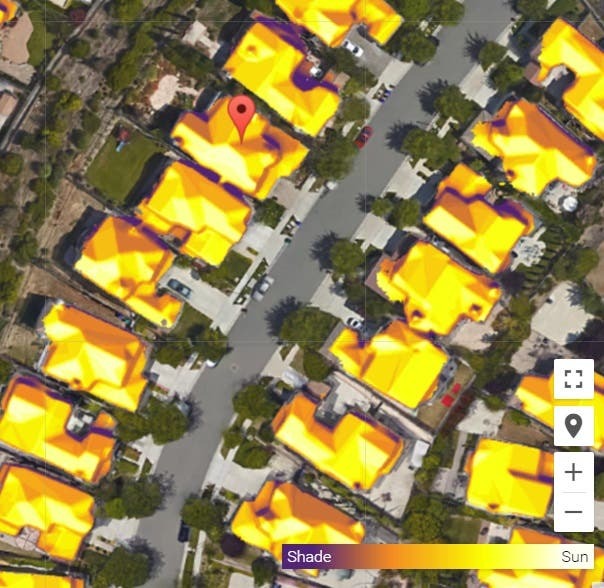 Dubbed “Project Sunroof,” it also provides information on things like the number of square feet available for solar panels on your roof based on 3D modeling, the number of hours of usable sunlight per year based on weather pattern analysis, net savings over 20 years, an average monthly electric bill, and recommended solar power system size. Currently, the Google service can provide information in the Boston area, the San Francisco area, Fresno, Napa, Sacramento, and Long Island. Partners for the project were not initially listed in the press releases, blog posts, and media coverage, so we decided to dig in and see who they are. Seeing offers from SunPower, American Solar Direct, Pick My Solar, Sungevity, SunEdison, NRG Home Solar, we can see that these are the highly regarded solar companies Google decided to partner with (in the initial San Francisco area where I live, at least). Providing this information for free is a great service, because it brings rapid clarity to those who are curious or interested but don’t know how to gather basic information about what kind of solar power system might work with their home and how much they could save by going solar. For example, do you know the square footage of your roof? Everyone knows how much they pay for their electricity each month, but you also know what size solar power system would cover your electricity usage?